The Komodo dragon (Varanus komodoensis), also known as the Komodo monitor, is the largest living species of lizard. Recent experiments showed that saliva contains venom that probably contributes to a deadly effect of bite. It is a type of monitor lizard, an ancient species of reptile with ancestors that date back more than 100 million years. Komodo dragons often fight with other dragons. They bite each other during the fight, but unlike other animals, they are immune to bacteria from their saliva. Komodo dragons live on only five islands in southeastern Indonesia: Indonesia’s four islands within Komodo National Park (Komodo, Rinca, Gili Montang, Gili Dasami), and the island of Flores. The islands are volcanic in origin, rugged and hilly, and covered with both forest and savanna grassland. Since they are cold-blooded animals, they spend much time on the sun to heat themselves. During rainy season, they will hide in their burrows to prevent heat loss. Adult Komodo dragons live mainly in tropical savannah forests. They prefer open lowland areas with tall grasses and bushes, but are also found in other habitats, such as beaches, ridge tops, and dry riverbeds. Young Komodo dragons are arboreal and live in forested regions until they are eight months old. The average lifespan of the Komodo dragon is about 30 years in the wild. Komodo dragon can run 13 miles per hour. Komodo dragons have reddish saliva that contains 50 different types of bacteria. Only one bite induces blood poisoning of their prey. During reproductive season, female lays 15-30 eggs in the hole in the ground. Their eggs look like balloons filled with water. Baby lizards use "egg tooth" to crack the shell from the inside. They will live on the trees from the moment they are born because adult Komodo dragons can't climb (and eat them). According to Guinness World Records, an average adult male will weigh 79 to 91 kg (174 to 201 lb) and measure 2.59 m (8.5 ft), while an average female will weigh 68 to 73 kg (150 to 161 lb) and measure 2.29 m (7.5 ft). Even without partners, female Komodo dragon can produce eggs. This type of reproduction is called asexual reproduction. The largest verified wild specimen was 3.13 m (10.3 ft) long and weighed 166 kg (366 lb), including undigested food. They can live more than 30 years in the wild, but only few years in captivity. Komodo dragons are gray, brown or reddish in color, depending on their location. Their robust bodies are uniformly covered in rough scales. They have strong limbs and a powerful, muscular tail. The heads of Komodo dragons have a rounded snout and ear openings. Their skulls are flexible and have about 60 short sharp, serrated teeth designed to cut and tear flesh. They have a clumsy, back-and-forth walk, and their yellow tongues flick in and out constantly. They usually hunt during the day because they don't see well during the night. Other than that, Komodo has poor sense of hearing. 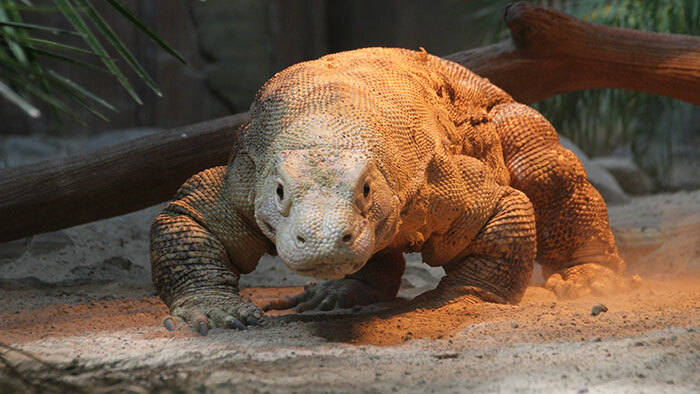 Komodo dragons are able to run at speeds of up to 20 km/h (12.4 mph), but tire quickly. They are excellent swimmers, swimming from one island to another and can even dive to depths of 4.5 m (15 ft). They are solitary creatures coming together only to breed and eat. Komodo dragons are mostly active during the day but have shown some nocturnal behaviour. They spend the day roaming their home ranges, which can be as large as 1.9 square kilometers (0.7 square miles). They do not defend these home ranges, so ranges can overlap, but if food is found in a shared area, the dominant dragon gets to eat first. Komodo has forked tongue (like snakes). It uses its tongue to detect a prey by smell. They can locate the prey that is 4 miles away using their sensitive tongues. The Komodo dragon uses its tongue to detect, taste, and smell stimuli, as with many other reptiles, with the vomeronasal sense using the Jacobson’s organ, rather than using the nostrils. With the help of a favorable wind and its habit of swinging its head from side to side as it walks, a Komodo dragon may be able to detect carrion from 4 to 9.5 km (2.5 to 5.9 mi) away. Komodo dragons are carnivores (meat-eaters), and will first scavenge carrion before killing for food. Adult dragons have gray, brown or reddish color of their skin. Young animals have green body covered with black and yellow stripes. Komodo Dragons are skilled hunters. They usually stalk and sneak up on a victim, lunging at it with amazing speed. They grab the prey in their strong jaws, sinking their serrated teeth into it. Komodos have a large amount of bacteria in their saliva, which helps to kill the victim as it enters the blood through the bite wounds. Prey that escapes the grip of the Komodo dragon usually dies later anyway, from the bacteria in their blood. They can eat prey that weighs 80% of their own weight. Unlike other animals, they will eat bones and hooves. They are such fierce hunters they can eat very large prey, such as large water buffalo, horse, deer, goats, pigs and even humans. They will also eat other reptiles (including smaller Komodo dragons), birds, bird eggs, small mammals and monkeys. Sometimes they consume human corpses, digging up bodies from shallow graves. This habit of raiding graves caused the villagers of Komodo to move their graves from sandy to clay ground and pile rocks on top of them to deter the lizards. Males engage in a ritual combat to mate with females. They wrestle in an upright position to try to throw the loser to the ground, often drawing blood. Mating occurs between May and August, with the eggs laid in September. The females make many camouflage nests/holes to prevent other dragons from eating the eggs. Clutches contain an average of 20 eggs, which have an incubation period of 7–8 months. They are born quite defenseless and are vulnerable to predation. They are carnivores (meat-eaters) who like to eat pigs, deer, snakes, fish and water buffalos. Adult komodo dragons are cannibals (eat their own species) and 10% of their diet is made of newly hatched Komodo dragons. Young Komodo dragons spend much of their first few years in trees, where they are relatively safe from predators, including cannibalistic adults, as juvenile dragons make up 10% of their diets. Juveniles feed on grasshoppers, beetles, small geckos, eggs, birds, and eventually small mammals. Komodo dragons are the top predators in their range, and adults do not suffer predation by any species. Young Komodo dragons sometimes fall prey to predatory mammals, birds and other Komodo dragons. The World Animal Foundation estimates the number of Komodo dragons in the wild to be 6,000. Komodo dragons are the largest lizards. They can reach 10 feet in length and weigh up to 200 pounds. Komodo dragons have long been great zoo attractions, where their size and reputation make them popular exhibits. They are, however, rare in zoos because they are susceptible to infection and parasitic disease if captured from the wild, and do not readily reproduce. In the wild, there are four times as many male Komodo dragons as there are females. Komodo dragons have the smallest home range of any large predator in the world! A Komodo dragon can eat a whopping 80 percent of its body weight in a single feeding. Komodo dragons eat extremely fast. They have been seen consuming 2.5 kilograms (5.5 pounds) of meat in one minute. Komodo dragon’s teeth look like shark teeth and have been compared to those of an extinct saber-toothed cat. A Komodo dragon goes through four or five sets of teeth in a lifetime. In 2013, a 2-meter (6.5-foot) long Komodo dragon wandered into a park office and bit two Indonesian park rangers.